I’ve discovered some rubber band hacks that make life so much easier. Undoubtedly, these little stretchy pieces of rubber have more uses than most of us ever imagined. Most people have rubber bands lying around the house. Either you purchased packages of them or they came on something you purchased, and you knew better than to throw them away. Or you’re a packrat like some people I know. These are all fairly common rubber band hacks. However, there are so many more things these little workhorses can do that you might not have thought of. As a height-challenged person, I have short arms. I typically look for tops with three-quarter sleeves so I don’t have to continuously push them up. They still keep falling down over my hands. One of my friends told me about some stretchy sleeve holders that would enable me to wear long-sleeve tops. The problem with them was the cost. They were expensive. Then I discovered that a couple of rubber bands provide the solution without the cost. All you have to do is slip a rubber band over the sleeve about an inch or two from the edge. Roll the edge of the sleeve over the rubber band to cover it, and your problem is solved. Instead of purchasing sleeve holders, I can simply use something I have in the house. Most of us have received those flat rubber jar openers from people marketing various items. They’re nice to have, but they seem to get lost in the junk drawer. That’s not a problem if you have a couple of wide rubber bands in the house. All you need to do is slip one around the lid and the other one around the middle of the jar. They provide plenty of nonstick support to help you open the jar without your hands slipping. Have you ever experienced the tag from your tea bag slipping into the cup? It’s annoying to have to reach in there and pull out the soggy tag. You can avoid that happening by using a rubber band to hold the tag in place. 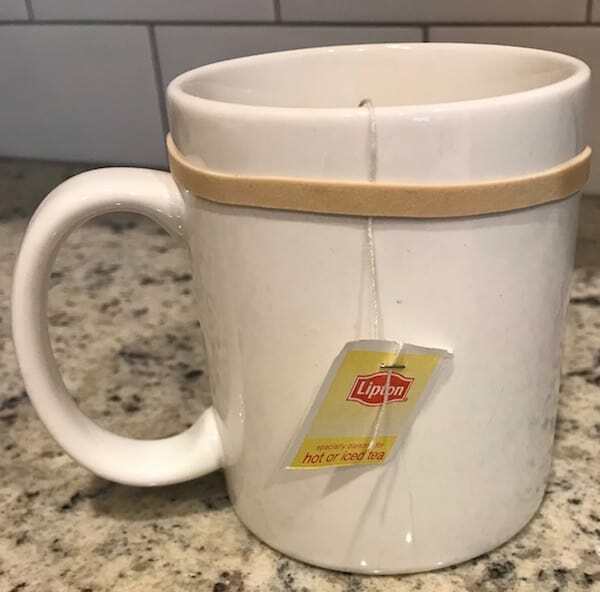 It’s easy to do and prevents having to put your hands in your tea. I like to keep a variety of vegetables on hand. The easiest way to do this without having them spoil is to purchase them frozen. 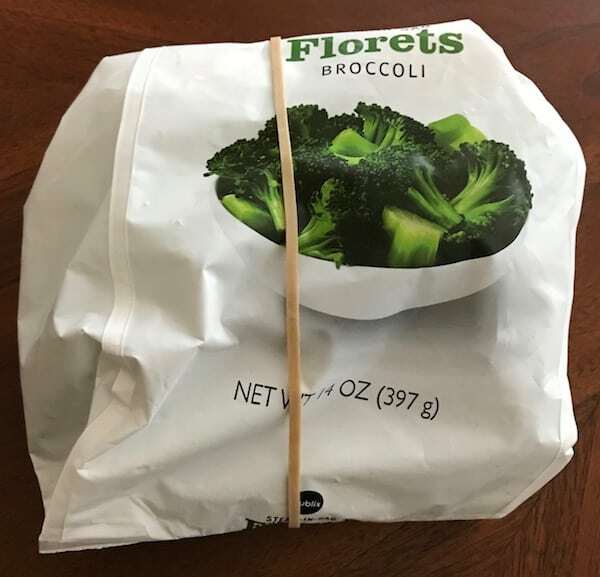 The problem is, once the bag is open, the contents can get freezer burn or spill. Prevent freezer burn by using this rubber band hack. If you keep a stash of rubber bands in the kitchen, just reach for one. You can either wrap it around the rolled up bag or cinch it on the open side. This is one of my favorite rubber band hacks for any type of open bag. One of the things I enjoy doing is going to potluck dinners. Everyone makes their best dish to share with others, so you can be assured of some tasty food offerings. I used to bring everything in a sealed plastic container and transfer it to a pot or casserole dish for fear that the contents would spill. However, that changed. As soon as I figured out the rubber band hack, it’s so much easier to transport the food. 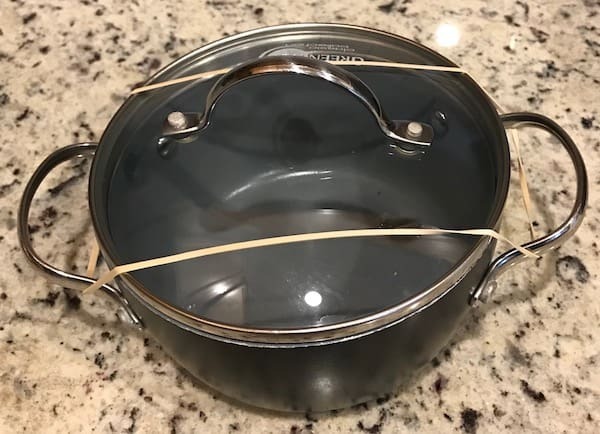 Secure a pot lid by using this rubber band hack. In order to secure the lid, stretch the rubber band over the top and around the handles on both sides. 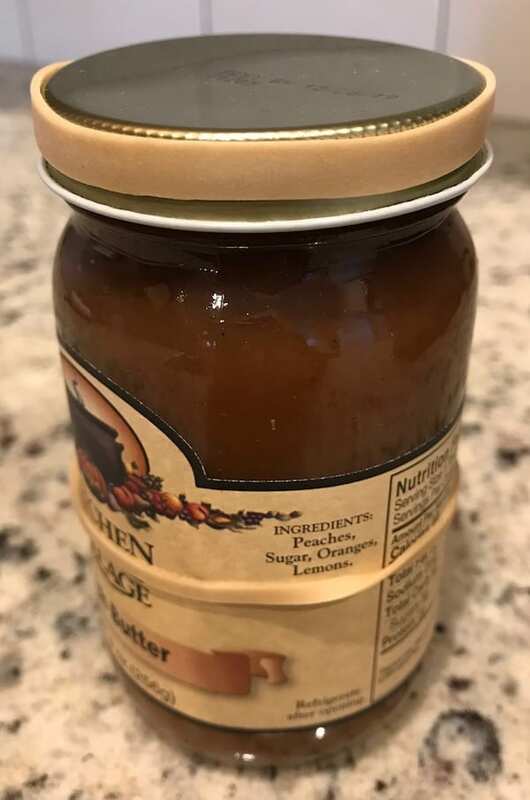 If you only have one handle, you can use a larger rubber band and go across the top of the lid and around the bottom of the pot. Once I started doing this, other people were amazed by the simple solution. Don’t be surprised when other people use this rubber band hack after they see how easy it is. Do you need to put your book down but can’t find a bookmark? Since we all know that dog-earing the page is damaging to the book, you need to find another solution. Hold your place in a book with this rubber band hack. 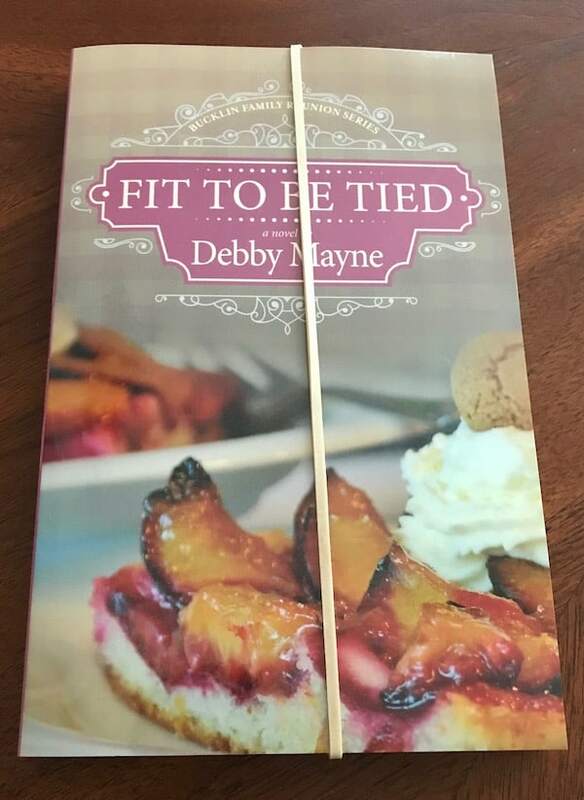 Pull a rubber band from your stash and wrap it around the section of the book you’ve already read. This way, when you come back to the book, you’ll be able to find your place right away. Rubber bands are plentiful. If you want to keep some on hand for every room in the house, you can do so. Where Is the Best Place to Buy Rubber Bands? When I start to run low, I pick up a pack of rubber bands wherever I happen to be. In fact, I’ve seen them in discount stores, drug stores, and grocery stores. 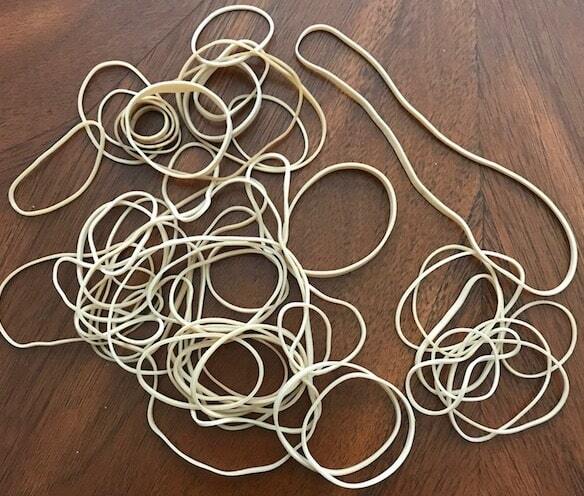 What Is the Best Size Rubber Band to Have? All sizes are good, depending on what you need them for. That’s why I generally get a pack that contains multiple sizes. Are Rubber Bands Safe for Children? I would be cautious with rubber bands around children. Babies and toddlers might put them in their mouths, while elementary age kids may get popped. Use your judgment based on your own experience with the children. Do Rubber Bands Have a Limited Shelf Life? Rubber bands will last quite a while. In fact, I’ve had some that were fine for years. However, over time, they are likely to become brittle, which decreases their effectiveness. When this happens, toss out the bad ones and pick up a pack of new ones. There are so many different ways to use rubber bands. If you’ve found some great rubber band hacks I haven’t mentioned, I would love to hear from you. If you spend a lot of time in the kitchen, you’ll want to read this: 10 Quick and Easy Cooking Hacks. Here are some more tips on YouTube: 23 Awesome Cooking Hacks.